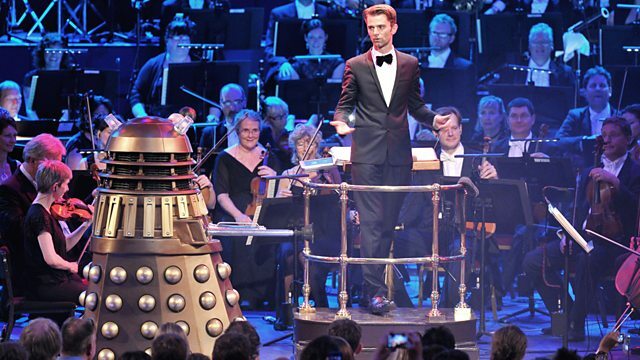 The Royal Albert Hall celebrates 50 years of Doctor Who with music from Murray Gold and the BBC Radiophonic Workshop. Special guests and a host of monsters join in the fun. Celebrating the 50th anniversary of the iconic and much-loved BBC series, this special event at the Royal Albert Hall features Murray Gold's popular music for the show, accompanied by specially edited sequences from the Doctor's most recent adventures. Hosted by the Doctor's friends, Madame Vastra and Strax, the concert also includes a look back at 'classic' Doctor Who series and the music created by the legendary BBC Radiophonic Workshop. Featuring special guest appearances by Matt Smith, Jenna Coleman, Peter Davison and Carole Ann Ford, who played the Doctor's first companion and granddaughter Susan Foreman. Plus, the Doctor and Clara drop in to join in the fun. Performed by the BBC National Orchestra of Wales, the London Philharmonic Choir, with soloists Elin Manahan Thomas, Allan Clayton and Kerry Ingram. Featuring unseen highlights from the concerts and appearances from the Doctor Who cast. Performer: BBC National Orchestra of Wales. Performer: Mark Ayres. Performer: Peter Howell. Conductor: Ben Foster. Performer: BBC National Orchestra of Wales. Conductor: Ben Foster. Performer: Elin Manahan Thomas. Orchestra: BBC National Orchestra of Wales. Conductor: Ben Foster. Performer: BBC National Orchestra of Wales. Conductor: Ben Foster. Choir: London Philharmonic Choir. Orchestra: BBC National Orchestra of Wales. Choir: London Philharmonic Choir. Conductor: Ben Foster. Performer: BBC National Orchestra of Wales conducted by Ben Foster. Choir: London Philharmonic Choir. Performer: Kerry Ingram. Performer: Allan Clayton. Orchestra: BBC National Orchestra of Wales. Conductor: Ben Foster. Choir: London Philharmonic Choir. Orchestra: BBC National Orchestra of Wales. Conductor: conducted by Ben Foster. Choir: London Philharmonic Choir. Performer: BBC National Orchestra of Wales. Performer: Mark Ayres. Performer: Peter Howell. Conductor: Ben Foster. Composer: Malcolm Clarke. Composer: Dudley Simpson. Composer: Paddy Kingsland. Composer: Peter Howell. Composer: Mark Ayres. Performer: BBC National Orchestra of Wales conducted by Ben Foster. "Screams echoed around the auditorium as Cybermen trooped down the stairs to menace the crowds. Not even the presence of an Ice Warrior helped cool the temperature inside the Albert Hall on the hottest day of the year."